"He will direct the draughtsmen embarked on board the frigates to take views of all remarkable places and countries, portraits of the natives of different parts, their dresses, ceremonies, games, buildings, boats and vessels, and all the productions of the sea and land, in each of the three kingdoms of nature, if he shall think that drawings of them will render the descriptions more intelligible." La Pérouse set sail from France in 1785 to continue the discoveries of Captain Cook, whom he greatly admired. 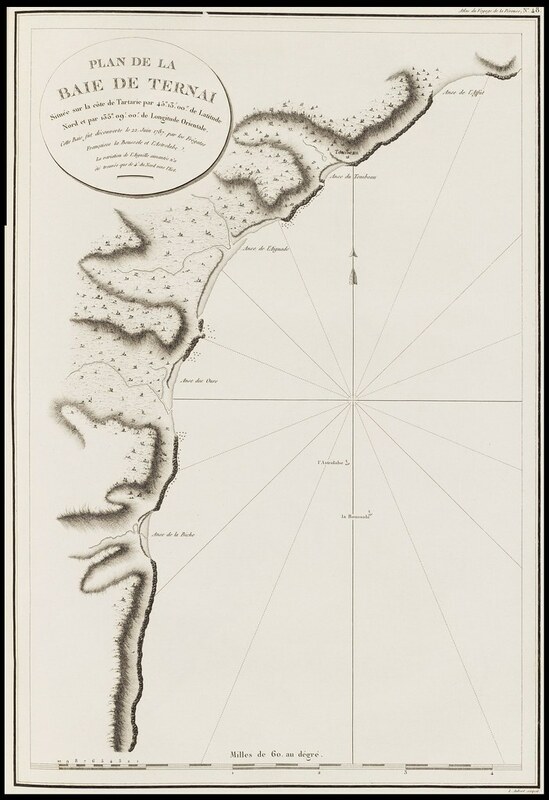 He was shipwrecked in 1788 but his narrative, maps, and views survived and were later published. 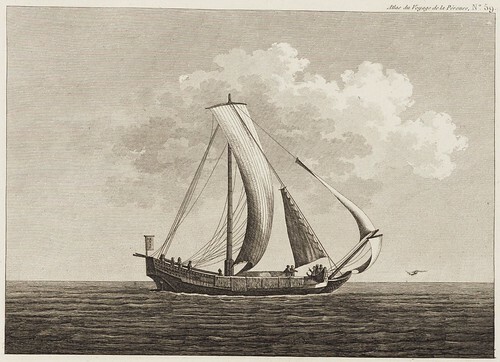 Ships were sent to Oceania in the early 1790s to look for La Pérouse and a further illustrated record followed. Example images from both works are seen below. A hornbill from the island of Pulau Waigeo, just off the coast of the Indonesian province of West Papua [in western New Guinea (Irian Jaya)]. 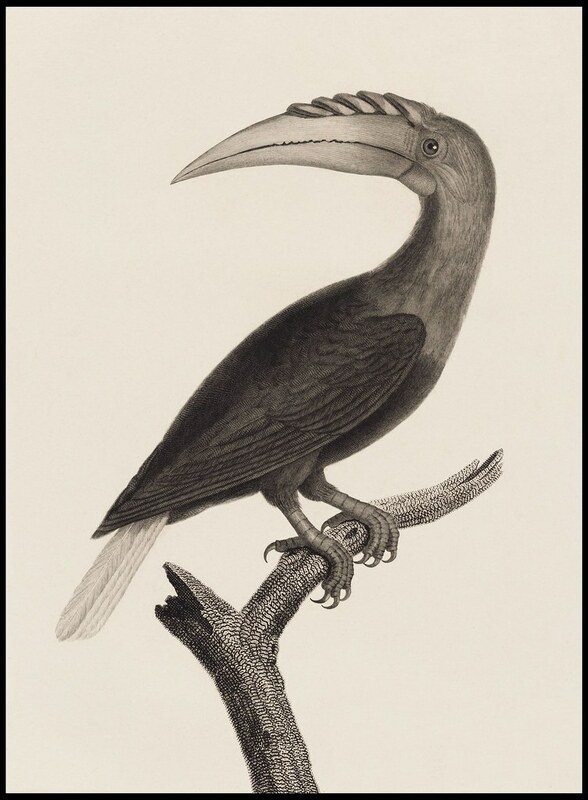 I think the species we see above is Blyth's (or Papuan) Hornbill [video]. More hornbill video (of varying species feeding) here. Click through to a very large version -- this is a particularly good example in which to see the technical quality of the engraving. 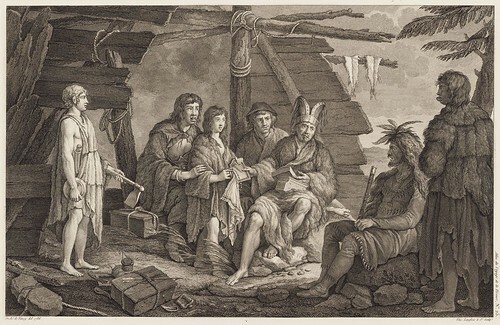 These two illustrations show Tasmanian Aborigines collecting seafood and preparing a meal (noting that the women do most of the work) and the second image includes a peaceful encounter between local Aborigines and Europeans. 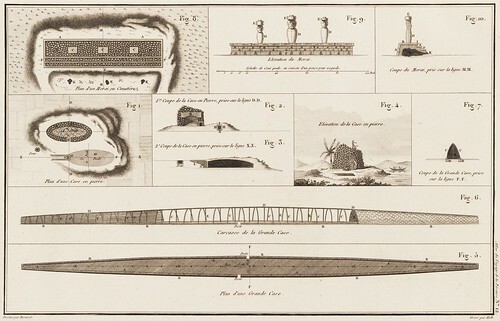 The sketches are by Jean Piron who accompanied a 1791 expedition under Bruni d'Entrecasteaux in the Recherche (and Esperance) looking for any trace of La Pérouse, who was last heard from in 1788 in Botany Bay. 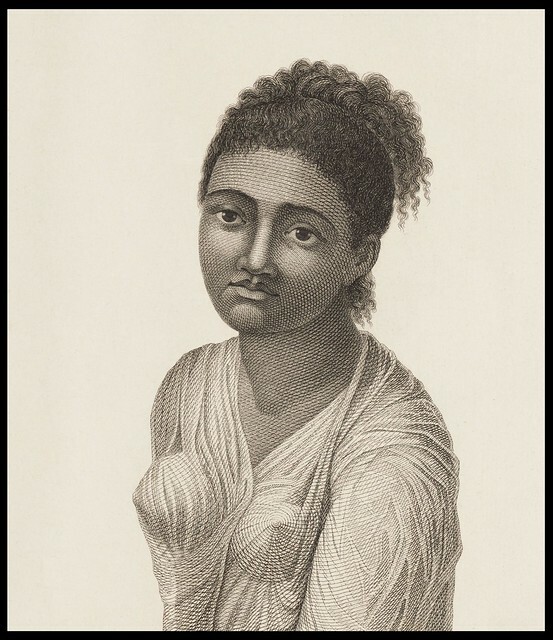 "This extraordinary encounter of racial harmony was eternalised by Piron, whose realistic sketch of the occasion was possibly spoiled by the Paris engraver’s emphasis upon classical artistic forms, which exaggerated Piron’s classicism. Given the ethnographic accuracy in this image, the background hills and totally unrealistic vegetation must also be the imaginative work of the engraver." "The special attraction was the preparation and eating of a meal. Food freshness was the keynote, because the women dived for crayfish, shellfish and edible seaweed, placed them on the coals and soon all were consumed. The women also maintained the fires. As the female divers stayed under the cool water for twice the time that the French thought possible, then had to prepare the meal, many attempts were made to influence the men to help, but to no avail. This visual and written account of the female role in food procurement was detailed, more so than most nineteenth-century observers, who stressed the male hunting role in mainland society. The women’s activities, in contrast with the men, who simply waited for the food to be caught and cooked, shocked the mores of French culture." 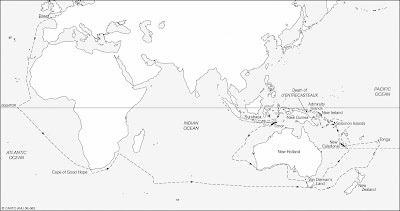 Tasmania (or Van Diemen's Land as it was then called) had been sighted by Europeans previously but the landing in 1793 of a party from the Recherche led to the first recorded encounter between indigenous Tasmanians and Europeans. 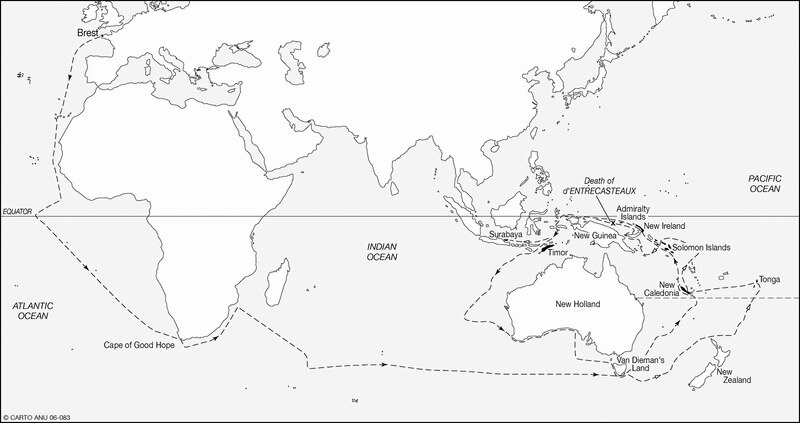 A number of diarists among the crew gave fairly similar accounts of the initial meetings between the sailors and Aborigines. "There was no need for arms and no fear of attack. Labillardière says that he approached the group of men, women and children holding out a biscuit (part of the meagre rations about which he grumbled) to an older man. He accepted it with a ‘very good grace’ and peaceful race relations were initiated. This long desired meeting with Tasmanians had at last taken place but, unfortunately, less than a week before the frigates were to sail. The amount of what may be termed observant participation during those few days is remarkable and so, also, is the agreement in the different accounts provided by officers and scientists. 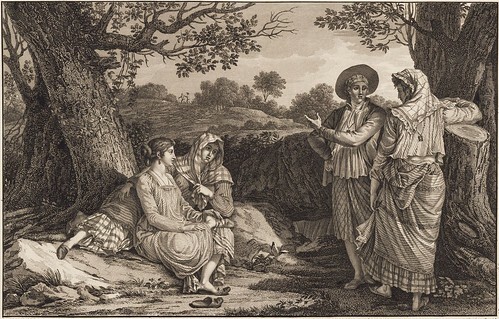 Although some of it must have been communicated by Labillardière (d’Entrecasteaux, for example, only mingled with the people once), the independent version by d’Auribeau is testimony to their attempts at objectivity. Resulting from this first week’s encounter on the Tasmanian mainland between inhabitants and Europeans is a precious record of Aboriginal culture only 10 years before British settlement overwhelmed traditional ways. There were 42 persons at this first encounter, seven men, eight women and their children, so at least half a band was present, possibly constituting seven families. They appeared fearless and eager to communicate. One piece of intelligence conveyed in mime eased the visitors’ concerns and demonstrated the peaceful nature of these presumed savages. During the night, while the French slumbered nearby, the Tasmanians visited, leaving them to sleep soundly. Neither then nor upon any other occasion were objects stolen, a virtue stressed by the French. Simple gifts were exchanged — a neckcloth and a handkerchief added to the biscuit, while a shell necklace was offered in return. 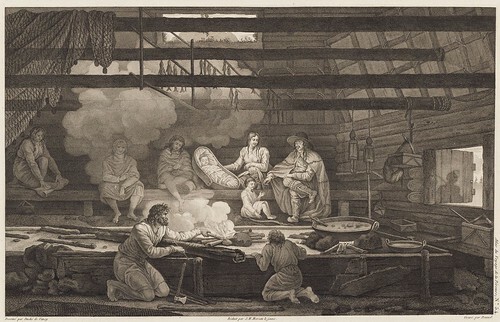 Clothing then followed, presumably a form of charity, because the French could not understand survival in that climate without clothes and they wore plenty because of the chill nights, but were burdened with them during the warm days. Although some people, including women, wore a wallaby or kangaroo skin on their shoulders, their lower body was naked. Nakedness was a feature emphasised by all diarists. Labillardière was amused to see seven girls watching events safely perched high above him on a branch; Delahaye was interested to note that they rejected offers of food and, not surprisingly, ‘were surprised to see hot water’. 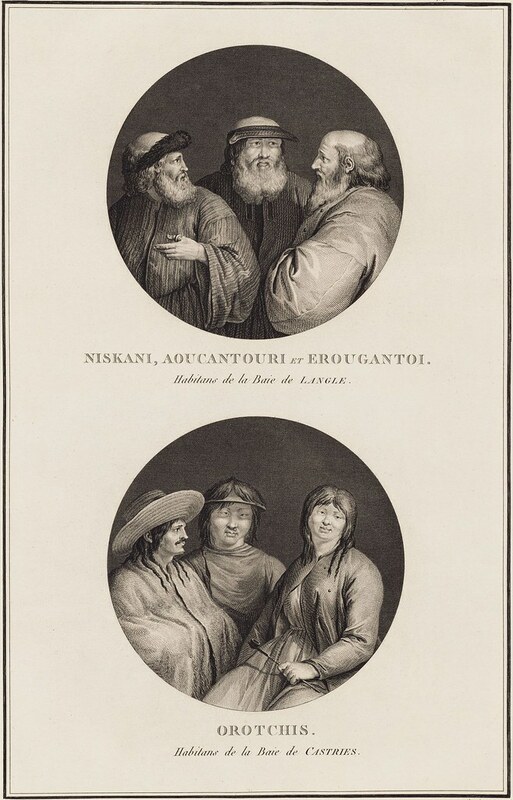 Labillardière made several careful ethnographic observations concerning their beards and ‘woolly’ hair; skin colour made darker with charcoal powder; and impressive cicatrices, incised, he later learned, with the edge of a mussel shell. He also used his knowledge of exploration journals to remark that unlike those New Hollanders reported to knock out their upper front teeth, they did not follow that custom." Such cordial relations between Tasmanian locals and European interlopers didn't last, regrettably. The population of Tasmanian Aborigines was decimated in the 1800s as a consequence of introduced diseases and conflict. A fairly recent 7-part documentary called First Australians [SBS] is available outside Oz - so my spies tell me - for viewing online. I cannot recommend it highly enough. It covers the history of the Aboriginal peoples - from all over Australia and not just Tasmania - from 1788 onwards and "explores what unfolds when the oldest living culture in the world is overrun by the world's greatest empire". The dvd is not compatible with US dvd players, but there is a 'First Australians' book edited by the Director/Writer/Producer of the series, Rachel Perkins [released about three months ago]. Inhabitants from Langle Bay on the Russian island of Sakhalin** (called Tchoka by La Pérouse [map]), North of Japan, and one of the original settlement areas of the Ainu people. Inhabitants from the Bay of Castries on the west coast of Russia (near Sakhalin island I suspect) in the loosely defined former geographic area of Tartary. Plan of Baie de Ternai, situated on the east coast of Russia (Primorsky Krai*) in the former Tartary region. "La Perouse's sailors were impressed with good fishing in the area." A settlement named Terney [Терне́й] was founded here in 1908. 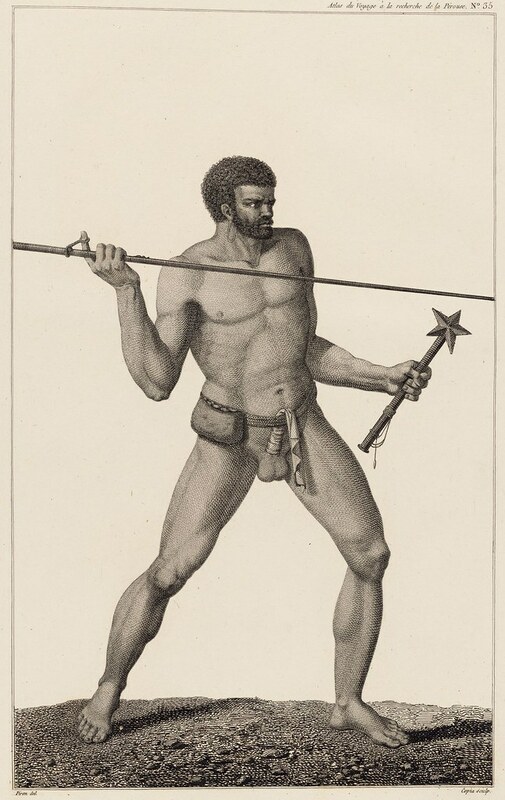 The New Caledonian savage hurling a spear is the most ferocious portrayal of an indigenous subject in the book about the search for La Pérouse. 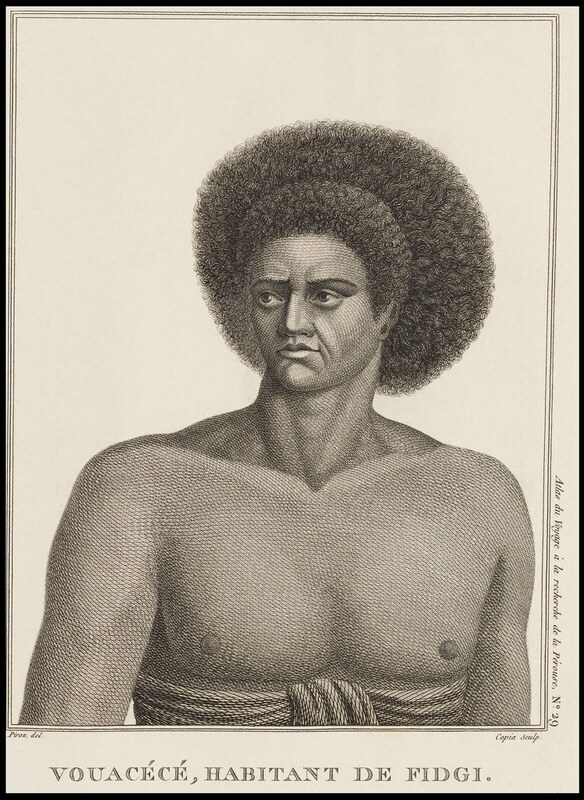 Commentary around suggests that there was a definite contrast in the way, for instance, natives from Tonga and New Caledonia were depicted. The French sailors found Tongans to be deceptively pleasant or non-confrontational while they hid their true intentions to rob the visitors. 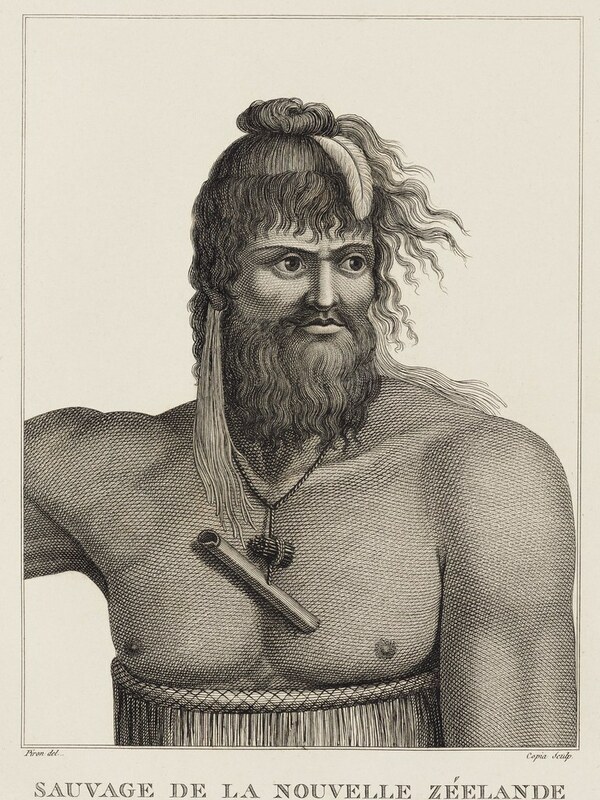 Kanaks (natives from New Caledonia) were said to be much more hostile from the start and the fellow in the above illustration may well have struck such an aggressive pose to ensure his tribe was regarded with fear by white people. [paraphrased - however inaccurately - from : 'Oceanic Encounters: Exchange, Desire, Violence' 2009 Edited by Margaret Jolly; also available in full from ANU] See also: 'In Oceania: Visions, Artifacts, Histories' 2009 by N Thomas. Customary dress of the native Tlingit peoples from what La Pérouse called Port des Francais, otherwise known as Lituya Bay [GBNP] in SE Alaska [map]. Adjacent glaciers feed into the bay and periodic ice calving* can be significant events with potentially disastrous consequences for anything in the vicinity or in the path of resultant huge waves. So it was in 1786 that two explorer boats from the La Pérouse voyage ships headed into the bay to take depth soundings and were swamped by tidal waves from a calved iceberg. Twenty one sailors lost their lives. Lituya Bay was the scene in 1958 of the tallest wave ever recorded (again, due to ice calving) and you can read more about this and the La Pérouse calamities at La Perouse at Port des Francais (Lituya Bay) on @qmackie's excellent Northwest Coast Archaeology blog. 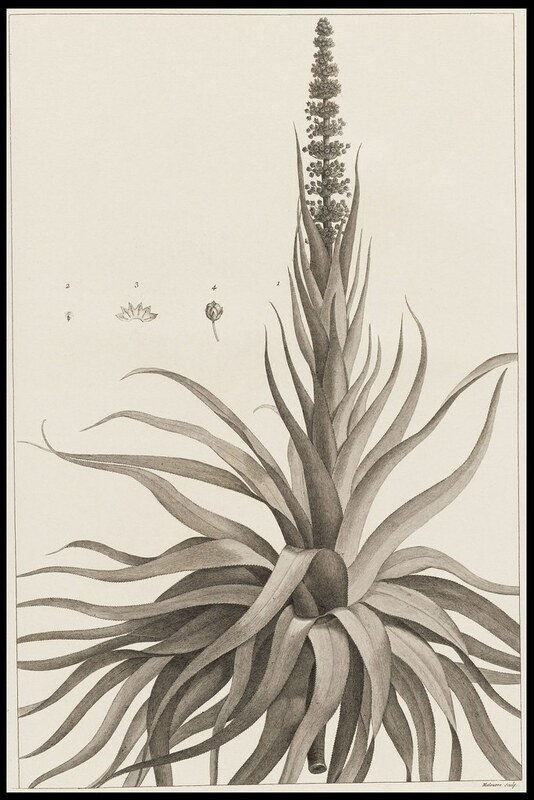 Of particular note here is that the drawing was by the great Pierre-Joseph Redouté, who sketched a number of plants for the La Pérouse books. 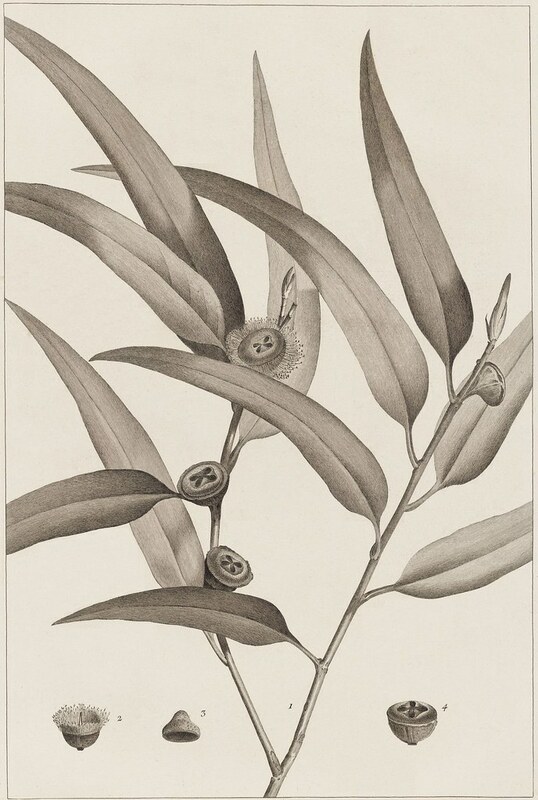 The Tasmanian Blue Gum is, I just found out, the floral emblem of some little southern island state or other. The naval career of Jean-François de Galoup, Comte de La Pérouse (1741-1788?) began when he was a teenager. He rose through the ranks over the next couple of decades after service along the eastern seaboard of Canada in frequent skirmishes with the British and a long expeditionary voyage in the Indian Ocean. La Pérouse was given his first command by 1780 and was promoted to Commodore the following year after defeating a British frigate in the West Indies. Further successful naval battles followed and La Pérouse gained a reputation for kindness towards the prisoners he captured and he was well liked by his crews. In 1785 Louis XVI appointed La Pérouse to lead an expedition to the Pacific to complete Cook's unfinished work. His ships were the Astrolabe and the Boussole, both 500 tons. They were store-ships, reclassified as frigates for the occasion and his 114-person crew included ten scientists from different disciplines. "[La Pérouse] left Brest on 1 August 1785 making for Brazil. 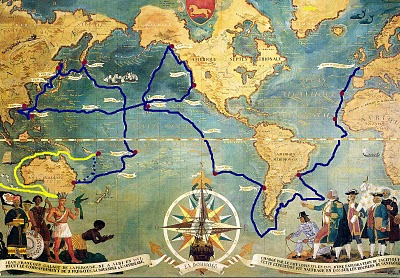 Doubling Cape Horn he refitted in Chile, then sailed to the Sandwich Islands and thence to Alaska, where he turned south exploring and surveying the coast as far as California. After a short refit at Monterey, he sailed across the Pacific, discovered uncharted islands, and visited Macao and Manila. After six weeks reprovisioning and refreshing he left on 10 April 1787 to survey the coasts and territories north of Korea, which had been described and commented on by Christian missionaries. He sailed up the Gulf of Tartary, naming several points on both its shores and learned that Sakhalin was an island. In September he put in to Kamchatka to replenish his supplies. From there he dispatched an officer, Lesseps, overland to Paris with accounts of his discoveries, while he turned south making for New Holland. 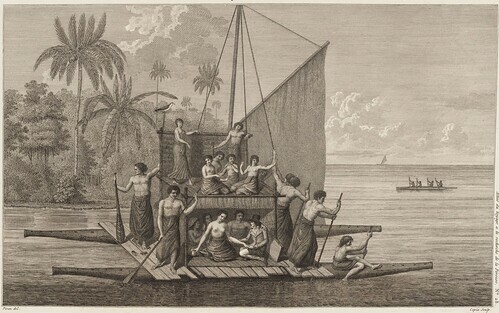 In December, at Tutuila, Samoa, which Bougainville had called the Navigator Islands when he explored them in 1768, natives suddenly attacked a party from L'Astrolabe seeking water and killed de Langle and eleven others. La Pérouse left without taking reprisals and sailed through the Pacific Islands to Norfolk Island and to Botany Bay. He was sighted off the coast there on 24 January 1788 but bad weather prevented his entering the bay for two days. By then Governor Arthur Phillip had sailed to Port Jackson, but John Hunter had remained with the Sirius and the transports, and assisted La Pérouse to anchor. He established a camp on the northern shore [map], now called after him, and maintained good relations with the English during his six-week stay. The vast majority of the images here come from Harvard University Library's copy of 'Atlas du Voyage de La Pérouse et la Recherche de La Pérouse', a combined publication that probably dates to 1799 or thereabouts. It covers both the primary voyage and the subsequent expedition searching for La Pérouse. These are the original plates. David Rumsey has a copy of 'Charts And Plates To La Perouse's Voyage', 1798 - the first British edition. 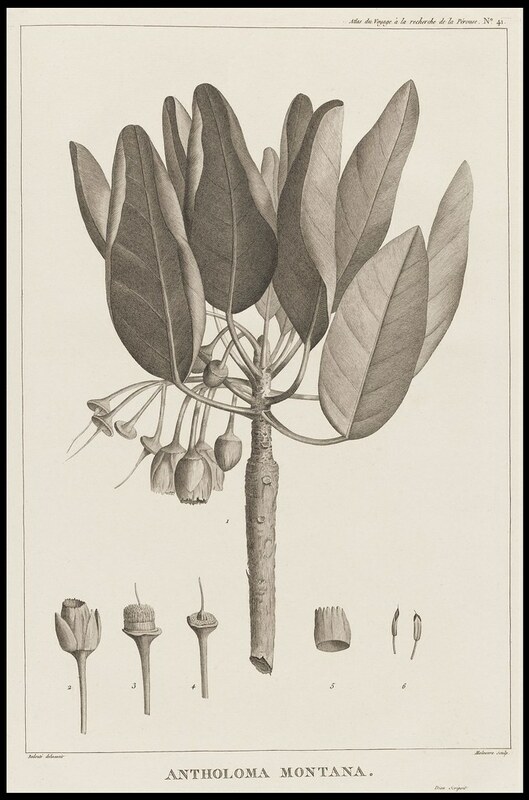 They have more images related to La Pérouse and some of the plates are inferior to the original quality. The Wikipedia article about La Pérouse includes descriptions of the explorations (some very recent) that have attempted to piece together what happened to the Astrolabe and Boussole -- shipwrecked on a reef on the island of Vanikoro in the Santa Cruz group (part of Solomon Islands now). Biography: Dictionary of Canadian Biography Online. Voyages: Scientific Circumnavigations 1679-1859 at Linda Hall Library of Science, Engineering & Technology. UPDATE (Aug 2013): Yovisto site post on the occasion of 228th anniversary since the commencement of the voyage. Hi, thank you for your fantastic blog et this post but you made a little mistake, his name is 'Lapérouse' in one word. Heh. Well I did think of this and decided simply to adopt the manner as above because it's also La Perouse and Laperouse w/ no accent; but after 300 years these spellings become local or at least arguable. I grew up knowing it simply as La Perouse without accent because it's the name of a Sydney suburb. So it's wrong (and right!) no matter how it's spelled. May I fully agree with with Peacay :The name was written in two words by all contemporaries of La Pérouse, including within King Louis XVI instructions.We have no reason to change and alter the image of the great explorer, even for the sake of modernism ! With post like this it's a pleasure stroll through Internet. Magnificent blog. It gave me a great pleasure. Thank you.